God’s own Country – II – Chellarkovil – Sitting pretty between Kerala and TN | Highway - the only way ! 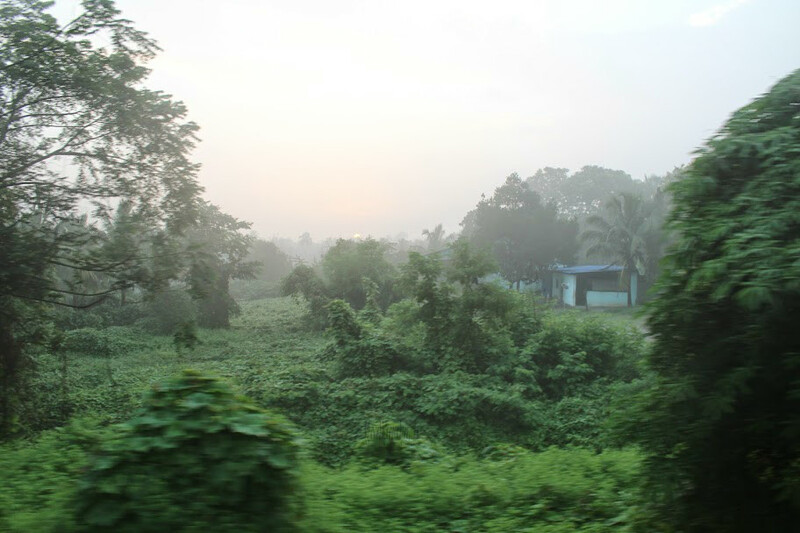 You know you are in Kerala when you look out of the train window early in the morning and are blinded by a dash of green everywhere ! The sun was just rising and the views outside clearly told you that you were in a divine place ! The anticipation only grew as we waited for our train to reach Kottayam. We finally arrived at 8.30 AM, our cabs were waiting for us at the railway station. Before that, we were treated to Kerala style breakfast of Appams at a hotel in the railway station. Must say, the Kottayam railway station is rather neat and has good food options. After filling ourselves, we got into our cabs, it was going to be a 3 hour drive to Thekkady. We were going to stay in Thekkady for 2 days. It was a delightful drive from Kottayam, we passed by traditional Kerala houses, coconut groves, lush greenery and all that define Kerala. On the way, we stopped for a cup of strong “Kattan Chai”, the official drink of Kerala ! 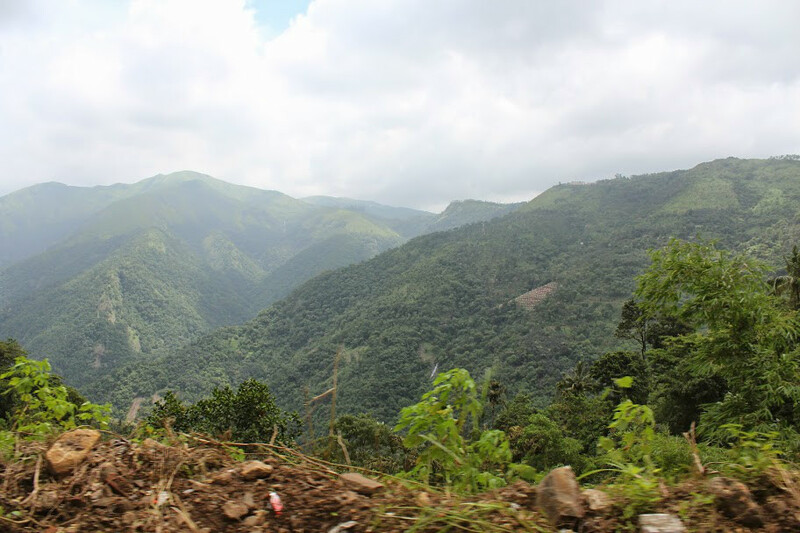 Soon, the Western Ghats mountain range came up before us. The winding roads gave this writer some motion sickness, especially after 2 nights of train travel but the scenes outside the window were so mesmerising that you forgot the churning in your stomach. Waterfalls cascaded from the mountains in the distance, the sight was enough to cure all kinds of sickness. 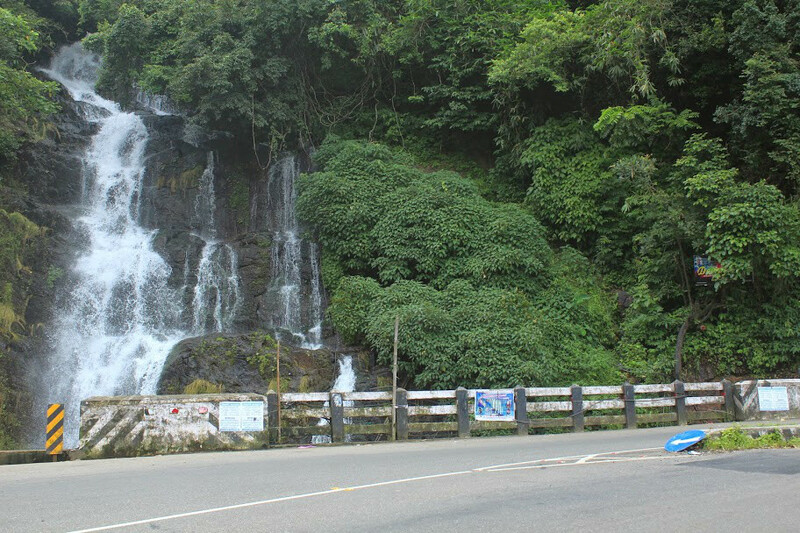 About an hour into our drive, we arrived at the Valanjaganam waterfall. 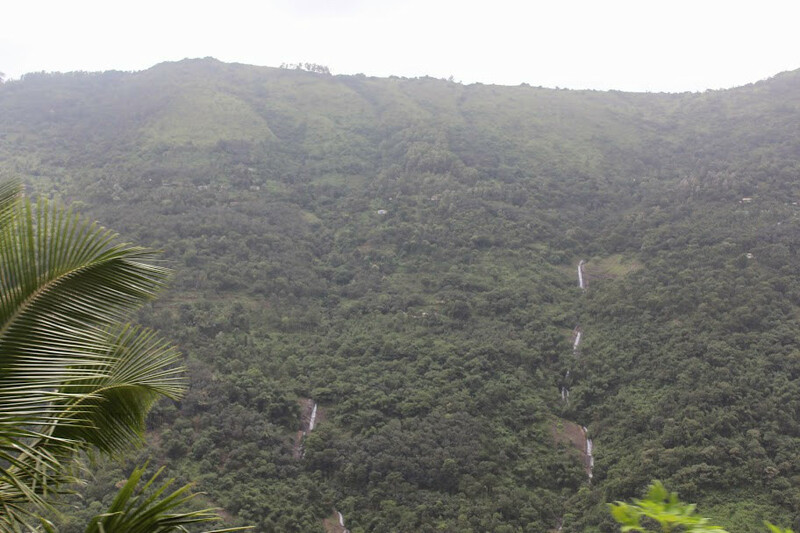 While driving from Kottayam, you cannot miss the waterfall because it is right beside the road. We were not expecting a waterfall enroute and when we spotted it, excitement got the better of us. What a refreshing sight it was ! A flight of steps take you down to where the waterfall ends. There are a few shops near the waterfall, people were stopping by for a hot cup of tea and snacks. Be a little careful while driving here because people seem to zooming on along the curve and suddenly braking when they see the waterfall ! 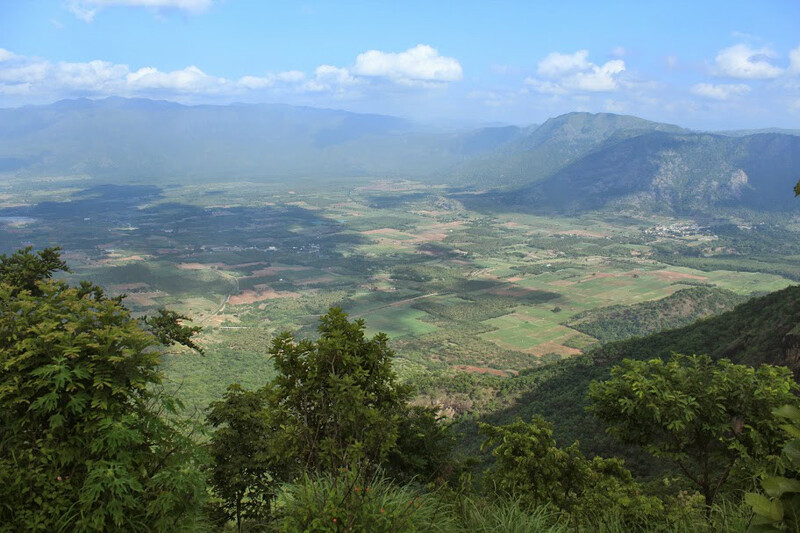 Chellarkovil – No boundaries for beauty here ! When we planned this trip, we wanted to spend some quiet, relaxing time amidst nature. Thekkady, many people told us, though a peaceful place, hardly had a few places to go around, we’d get bored especially with a plan to spend 2 days. We, however, stuck to our plan and booked our stay at Manayath Heritage Homestay at Chellarkovil, a small village near Thekkady. July being the off season, we got an awesome deal with the entire property rented out to us for as low as Rs.6,000/- per night ! It was nearly lunch time when we were in the vicinity of Chellarkovil. Our hosts at the homestay had requested us to have lunch before arriving since they had some logistical issues in arranging lunch that afternoon. We packed lunch from a hotel on the way and reached our homestay. We were totally sapped off our energy by the time we reached the homestay but one look at the place and our energies seemed to magically recuperate ! That’s how beautiful the place was ! 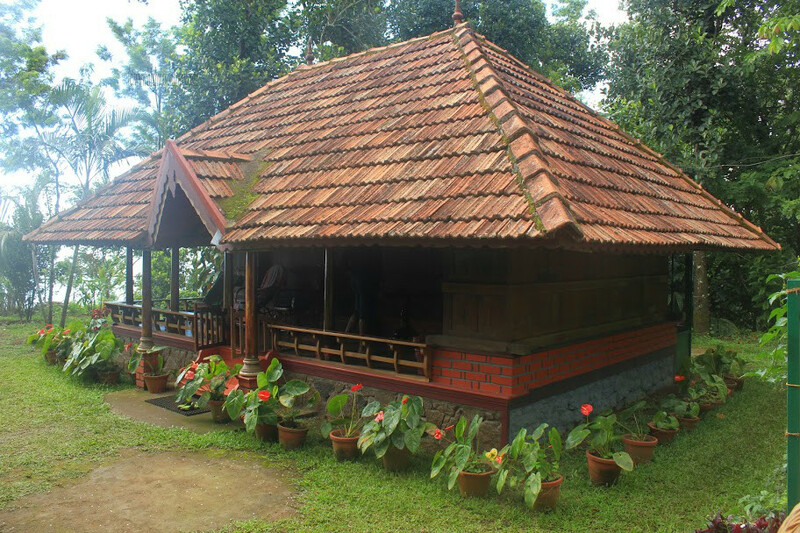 Nestled in the middle of cardamom estate and lush greenery, the first thing you will love about Manayath Heritage is this cute, traditional Kerala House. The owner Mr.Thomas, a pleasant gentleman, told us the house was built using 150-year old wood from their ancestral house near Kottayam. It is quite an experience staying in this house. Equally charming is this cottage built on a raised platform using tree trunks. The cottage overlooks the hills around and the plains below. 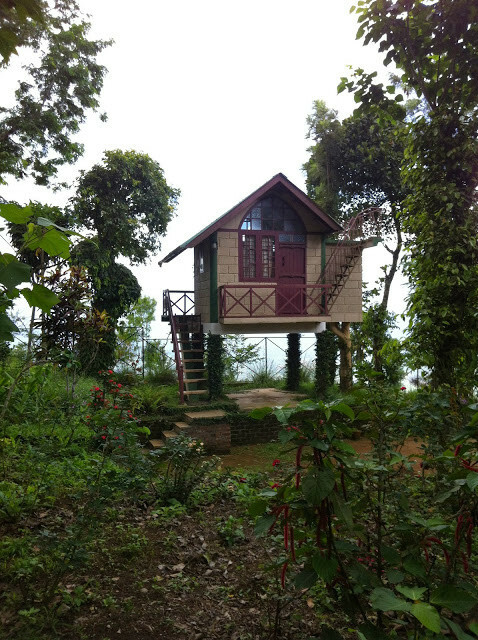 There is one more cottage and a tree house perched high among the trees where you can relax with a cup of tea. Be a little wary of the wooden steps leading upto the tree house, they are a little unstable and keep wobbling, watch your step and climb slowly, one person at a time ! The best part of the homestay is this spot at the edge of the property. 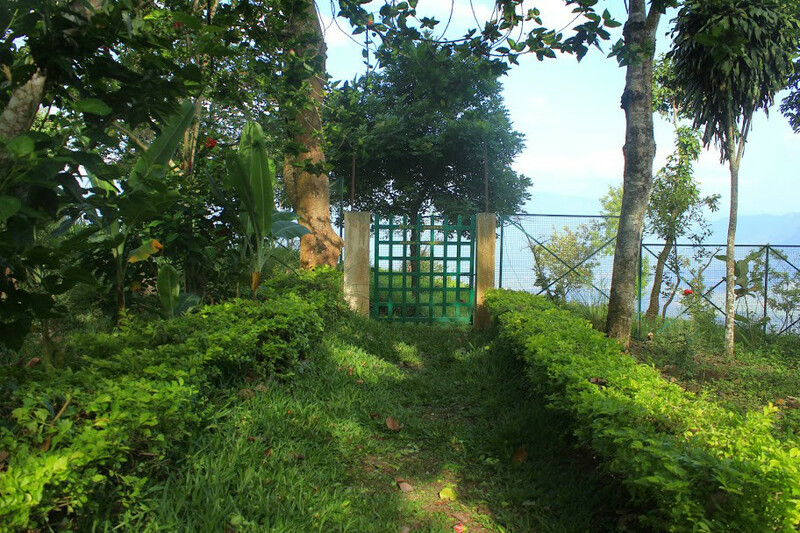 The green gate marks the boundary between Kerala and Tamil Nadu, the official state boundary runs through the village of Chellarkovil and the homestay. Beyond the gate is Tamil Nadu, so you can just open the gate and walk into the neighbouring state ! We were absolutely thrilled and decided to go and explore Tamil Nadu later in the evening. Before that, we refreshed ourselves and sat down for lunch. There is a separate dining area with a stove, in case you want to make something on your own. 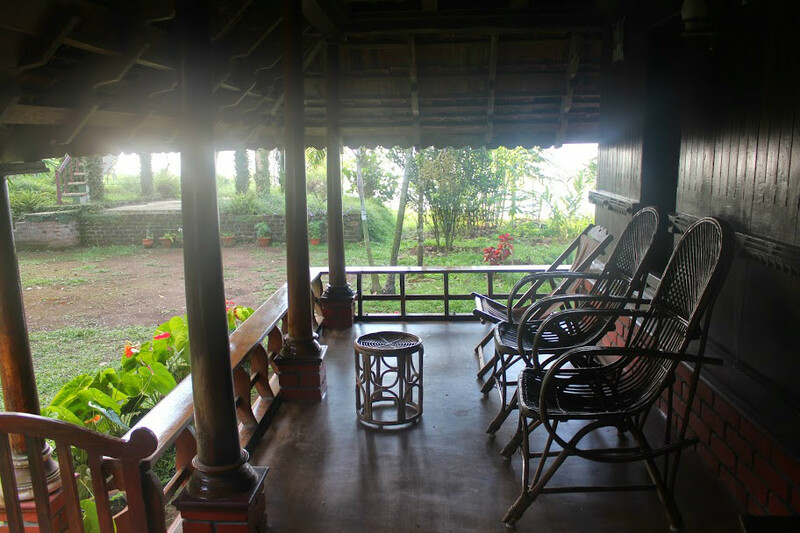 Post lunch, we all settled down for a pleasant siesta in the veranda of the Kerala cottage. The rooms were neat and cozy but nothing like sleeping out in veranda taking in the soft breeze ! At around tea time, we went for a walk beyond the gate into the TN side. 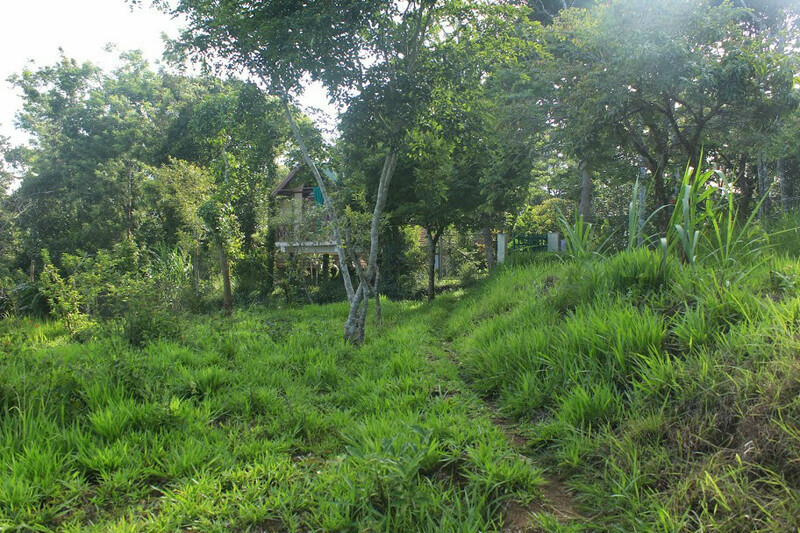 The trail led us down the slope on which the homestay is located. The grass was so fresh that its green colour looked like some fluorescent light effect ! From the slope, as far as we could see, there were green mountains and fields stretched below us for miles. The clouds cast a shadow on the mountains and the plains. Whichever side of the border we looked, we couldn’t draw a boundary to the beauty of Chellarkovil. We walked around for sometime while the kids had fun with the numerous Touch-me-nots, lazed on the grass and simply stared up at the sky. There was not a sound except for the breeze. There is a cliff nearby, in the peak monsoon season, there is supposed to be a waterfall here. 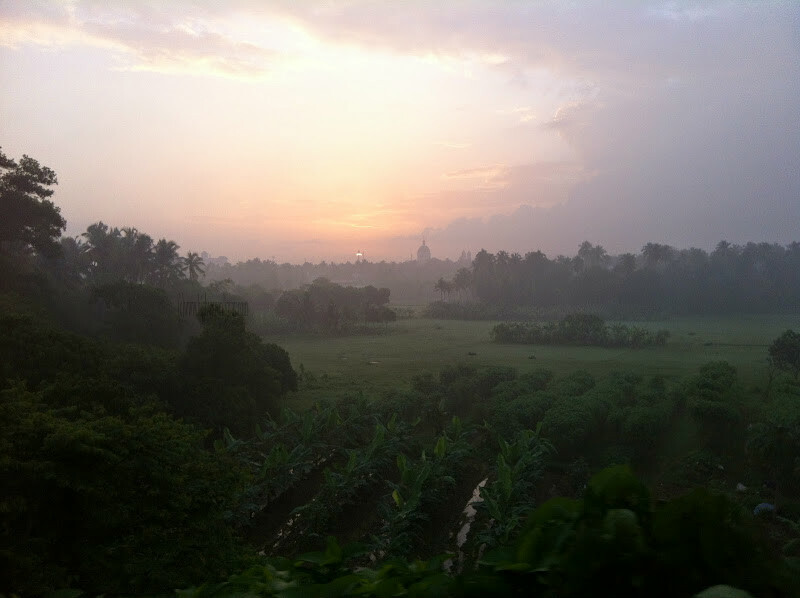 We were told, there were no heavy rains even in Kerala and we were lucky in a way that the weather was pleasant instead of getting caught in heavy Kerala monsoons. In places like these, there is you wouldn’t find any activity, you could go on a trek but we say, just sit back and live the moment. That’s what we did at Chellarkovil. Evening drew on as we chatted to our heart’s content. Dinner was arranged by Mr.Thomas, it was a simple Kerala style dinner with some fried rice, roti, dal and chicken curry. Being big time foodies, we have to admit, the dinner left us a tad disappointed, we don’t blame the homestay because tastes vary from person to person. It did not in anyway spoil the fun, we enjoyed a quiet family dinner. As we retired to bed, we could see the lights of villages nearby, the tiny glowing dots in the backdrop of the dark mountains looked like a string of precious gems sparkling in the dark. Up in the sky, more diamonds were twinkling ! The richness of nature almost knocked us off to sleep ! 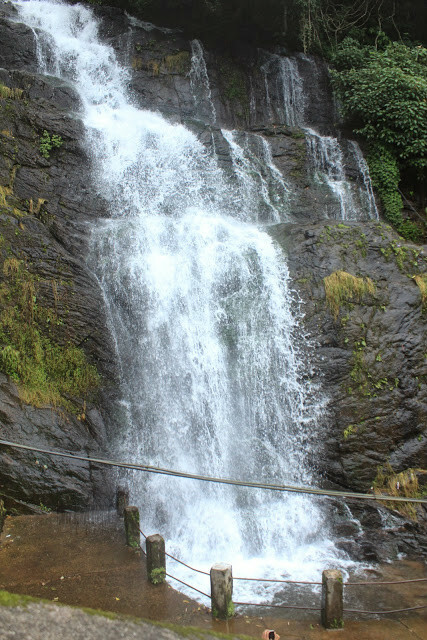 – Chellarkovil is about 12 kms from Thekkady. 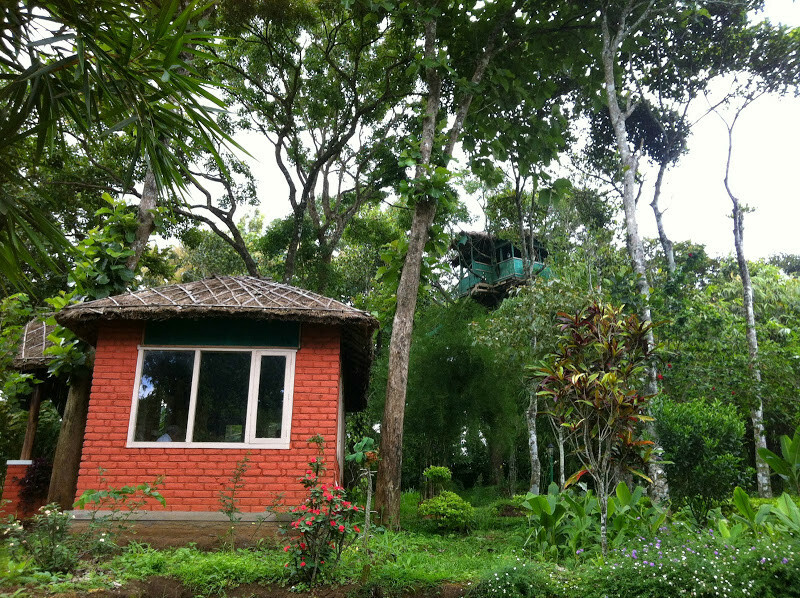 If you are planning to stay at Thekkady, instead of the usual resorts, you could try Manayath Heritage, the property is beautiful and very serene. – You can get info on Manayath Heritage from their website. If you are travelling as a big group, they can rent out the entire property, otherwise you can chose from the Kerala house, the regular cottage or the log cottage. The people of the homestay are very pleasant and accommodating. – If you do not have your own vehicle, the homestay can arrange for pickup/drop and local sightseeing. – Food is one area that we weren’t fully satisfied but that could depend on our personal preferences. The homestay owner’s family does the cooking so you can give them your suggestions or even help them with the cooking. Also, if you are the strong coffee, tea drinking kind, carry your own coffee/tea packets. The Kerala style tea is not everybody’s cup of tea !! You can use the kitchen to make coffee/tea, however, they also levy kitchen usage charges, we were quite surprised when we saw that in the final voucher. – You can buy Kerala spices from the home stay, most of the them are grown in the homestay itself. – There is not much for the kids to do around here, so if you are travelling with kids, make sure you carry some activity stuff for them. – There are a few shops in the village for small utilities. You can request the homestay owner for anything else as he keeps making rounds to the nearby town. Mobile phone signals are not an issue here.